You probably recognize celosia (Celosia argentea var cristata) for its use in dried wreaths and floral arrangements, as well as fresh arrangements. Deep rust red is the most common color, although purple, yellow or pink celosia flower varieties have gained popularity in recent years. This annual plant has a velvety, ruffled form that is often compared to a cockscomb, or even a brain. In fact, it’s commonly known as cockscomb or woolflower. Celosia seems like an exotic flower, but it’s not difficult to grow in the home garden. It makes a striking accent to other flowers in the garden. Dry it in the fall for use in dried arrangements. You’ll find celosia plants in nurseries in late spring, which is the simplest way to grow it. It doesn’t tolerate frost and should be planted outside only after summer weather has arrived. 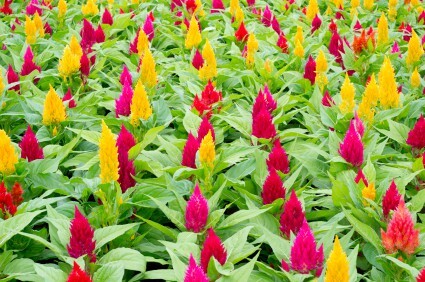 Celosia needs rich soil to support its fast growth. Dig plenty of manure or compost into the soil before planting. These organic amendments also improve drainage, which is important because celosia doesn’t tolerate wet conditions. When buying nursery plants, check the roots. Avoid plants with tangled, crowded roots, which will grow slowly or not at all. Be gentle when planting celosia because its roots are easily damaged during transplanting. Plant celosia in full sun or partial shade. Alternatively, you can start celosia indoors four weeks before the last frost. Spread the seeds in a tray filled with high-quality potting mix. Cover the seeds with ¼ inch potting soil. Celosia doesn’t need light to germinate and can actually be hindered by it. Mist the soil with water and cover the tray with plastic wrap. Mist the soil every day as needed to keep it moist. Celosia seeds will not germinate if they dry out, so this point is important. Store the seeds in a location with daytime temperatures between 80 and 85 degrees, and nighttime temperatures between 65 to 70 degrees. Once the plants stand 4 inches tall, they can be moved outdoors. Alternatively, if you live in a mild climate, you can sow celosia directly in the garden. Celosia grows quickly under the right conditions, namely consistently moist, but not soggy, soil. Taller plants might need staking. Apply a balanced fertilizer every six weeks throughout the growing season, especially if growth slows. Celosia suffers from a few diseases, including powdery mildew, oedema and fungal leaf spot. These problems can usually be avoided through good cultural practices. Space celosia at least 6 to 12 inches apart so air circulates freely. Use soaker hoses instead of overhead sprinklers, which encourage the spread of disease, and avoid working in the garden when it’s wet. Fungicides are helpful, but rarely necessary for this annual plant. In severe cases, remove and discard diseased plants. Nematodes or mites can occasionally infest celosia, but in most cases, the damage isn’t severe. Plant celosia in a new location if you experience these pest problems. The ‘Sparkler’ series is a favorite for dried and cut flowers. These plants come in a variety of hues and have strong stems, making them an ideal choice for arrangements. ‘Chief’ is a series of plants that grow 3 to 4 feet tall. These plants are also used in dry arrangements. For use in the garden, consider ‘Jewel Box,’ a dwarf variety that grows only 6 to 8 inches tall. Celosia plumosa from the University of Florida IFAS Extension. Celosia Production as a Cut Flower from the University of Maryland. YouTube has a great video about the basics of celosia. Could you suggest the weather conditions required for cockscomb. Cockscomb is really easy to grow and produces tons of seeds. Throw the seeds out and with hardly any work you will see the little sprouts growing. Thin them often for larger plants. where are the seeds on my current celosia plant please. I am planning on growing my garden from seed next year..
where are the seeds on my current celosia plant? i harvested about 200 seeds from my celosia after they’d died back. they’re very tiny black seeds hidden in the centre of the flower head. When I plant my celosia transplants out, many times there are small flowers beginning to grow on the plants. Some of the varieties can not be pruned back to help the young plant get established. Do you know which ones cannot be pruned back?